If you use Google Calendar, you can integrate any of your Trello boards' calendars with Google Calendar, so you can view your calendars and your cards with due dates together in one place. To begin, enable the iCalendar feed and find the iCalendar URL for your board. Click "Calendar." Enable the Power-Up if you haven't already. Then click the gear icon to see the "Calendar Settings"
Once there click "Enabled" to enable the iCalendar feed. If you don't have this option, you'll need to ask a board admin to enable this setting. Copy the URL from "Your Personal iCalendar Feed." Next, open Google Calendar, and click the ellipsis icon next to "Add calendar" on the left side. Click on "From URL." 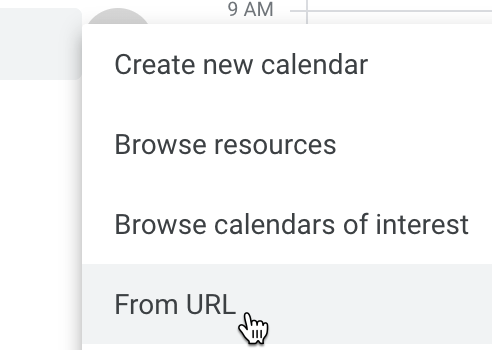 Paste the iCalendar URL into the box, and click "Add Calendar." Google Calendar will add your Trello board calendar and it will be assigned a color. You'll find the calendar listed under the "Other calendars" section. Not seeing updates in your calendar? 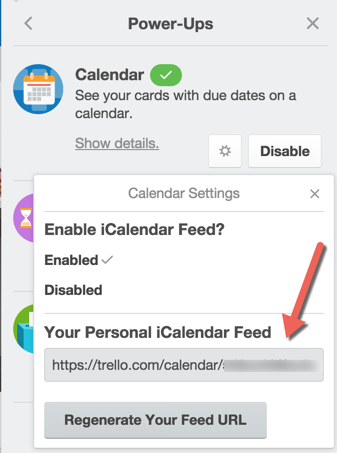 Changes made in Trello won't instantly update to third-party applications such as Google Calendar when using the iCal feed method below. We estimate that Google Calendar and other third party applications update their external feeds approximately once per day, but that is dependent on how frequently the third party application pings the Trello servers. There are some speedier alternatives available through third parties, such the Cronofy or Planyway Power-Ups.